The National Baseball Hall of Fame and Museum is an independent, 501c3 non-profit educational institution dedicated to fostering an appreciation of the historical development of baseball and its impact on our culture by collecting, preserving, exhibiting and interpreting its collections for a global audience as well as honoring those who have made outstanding contributions to our national pastime. The Hall of Fame’s mission is to preserve the sport’s history, honor excellence within the game and make a connection between the generations of people who enjoy baseball. The institution functions as a museum, Hall of Fame, and research library. 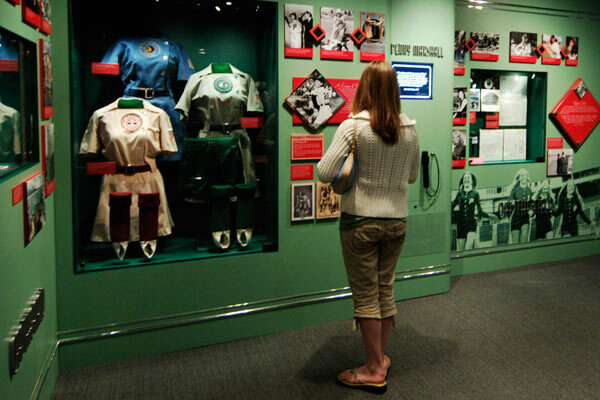 The Museum’s Diamond Dreams exhibit salutes the roles women have played in baseball from the diamond to front office. Learn more about the National Baseball Hall of Fame and Museum. Above: Diamond Dreams Exhibit at the National Baseball Hall of Fame. Photo Copyright © Milo Stewart Jr./National Baseball Hall of Fame Library.